Douglas Snelling's two houses in Mosman – the Blau and Keith Smith residences he built in the late 1950s at Chinaman's Beach – will be highlighted in a public lecture on 4 November 2013. Sydney modernism expert and architect Bruce Eeles, who grew up in Mosman and designed (with partner Kathy Trelease) the Sacred Heart Catholic School on Military Road, will include the Blau and Smith houses in his Mosman Library talk about 'Mid-Century Modernism in Mosman'. Other 1950s and 1960s architects he is promoting include John James, Ken Woolley, Stan Symonds, Eric Nicholls and Harry Seidler. 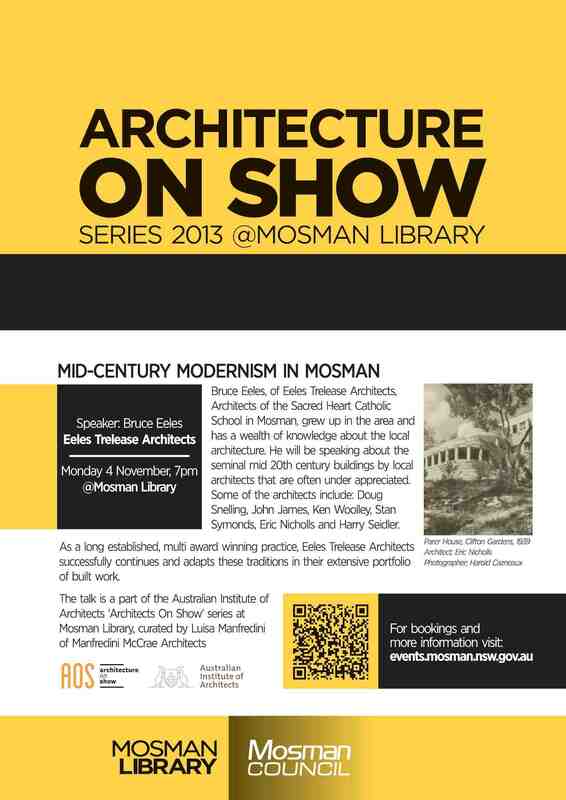 The Eeles talk is being organised by Luisa Manfredini of Manfredini McCrae Architects and is supported by the Mosman Council Library and the Australian Institute of Architects.